The conservation of natural ecosystems and biodiversity in the EU is maintained in the Habitats Directive, which focuses on protected habitats and species. La Pinta. 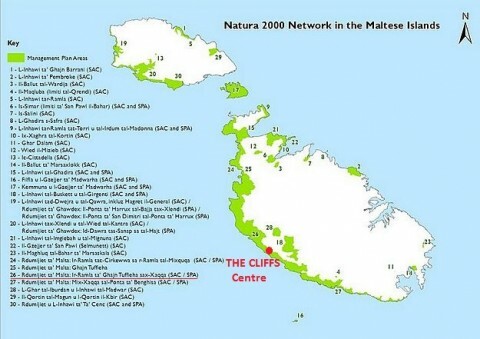 Ltd, which runs THE CLIFFS Interpretation Centre was formed in 2007, the same year in which the latest amendments to the Habitats Directive was made. Moreover, in 2007, the project for the establishment of terrestrial management plans for the NATURA 2000 Network of Special Areas of Conservation (SACs – Habitats Directive) and Special Protection Areas (SPAs – Birds Directive) was initiated. From the beginning, La Pinta Ltd. aimed and is still striving to promote the conservation of biodiversity, enhance local land user inputs, contribute to socio-economic development and disseminate information. THE CLIFFS Interpretation Centre is found in the middle of the largest SAC in the Maltese Islands. One innovative means of disseminating natural, socio-cultural and historical information is through the culinary experience in the food offered, in which visitors are informed of the wide range of flora species that can be encountered at the cliffs. The recent development of the walking trail and audiovisual, numerous lectures, information displays, colouring material for kids and the provision of local produce at THE CLIFFS Interpretation Centre are also in line with Article 33 of the Habitats Directive, to “promote education and general information on the need to protect species of wild fauna and flora and to conserve their habitats and natural environment”.